The holidays are coming. This is the time when we want warming comforting hearty cosy meals. We want to keep it plant-based but on the other hand we want to spoil ourselves a bit because it’s a time of celebration after all. 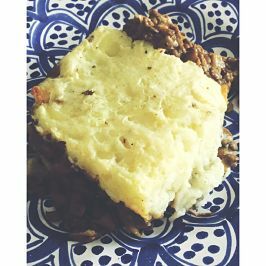 A great plant-based main star of cosy holiday evening is this delicious Vegan Shepherd’s Pie that just hits all the right spots. Serve it with green beans, roasted carrots, roasted Brussels spouts and extra vegan gravy and you’ll have a beautiful complete holiday meal. Preheat oven to 400 F. Put the garlic with the skin in the oven to roast for 15 min. Peel the potatoes and cook until soft. Drain the potatoes, at them back to the pan. Take the garlic out of the oven, peel them and add to the potatoes. Add the olive oil, dash of almond milk, salt and pepper and mash everything together. Put the mashed potatoes aside. Heat oil in a skillet over medium heat. Add chopped mushrooms and cook until liquid comes out. Take the liquid out of the pan and put aside. Add a little drizzle of oil add the onion and cook until mushrooms brown and onions are golden. Add the flour and spices and mix in and toast for 2 to 3 minutes. Then add the soy sauce or tamari. Add the milk, water and mushroom liquid, salt and bring to a boil. Keep stirring. It will take more or less 5 minutes to thicken. Taste and adjust the flavor and/or thickness of the gravy. NOTE: make double the amount if you want to have extra gravy on the side of the shepherd’s pie. The gravy can also be made without mushrooms. instead of using water, use vegetable stock in this case. Cook the lentils and drain well. While the lentils are half way cooked, add the peas, carrots and celery to the mushroom gravy and let it cook in the gravy until the lentils are done. If the gravy gets too thick add some water and/or almond milk. Add the cooked lentils to the gravy mix. Grease a standard size oven casserole dish (9×13 inches) with some olive oil. Add the lentil gravy mix and spread it out evenly. Then layer the mashed potatoes evenly over the lentils. Drizzle some olive oil over the mashed potato layer and let it brown in the oven for 15-20 minutes.